Bolivia's new president pledged Friday to call early elections and take other steps to calm a country paralyzed by weeks of opposition protests that forced his U.S.-backed predecessor to resign. Eduardo Rodriguez, the Supreme Court chief justice, automatically became president after Congress accepted the resignation of former President Carlos Mesa late Thursday and two congressional leaders first in line for the post declined the job. Hoping to quell the fury of tens of thousands of indigenous poor, Rodriguez declared he would work with lawmakers on key reforms to heal growing rifts in South America's poorest nation. "Bolivia deserves better days," Rodriguez, 49, told lawmakers. "I'm convinced that one of my tasks will be to begin an electoral process to renew and continue building a democratic system that is more just." Under Bolivia's constitution, Rodriguez must call presidential elections within 180 days. Evo Morales, the anti-U.S. leader of the protests, said early national elections are key to defusing the country's political and social crisis. Such a vote could also boost the presidential aspirations of the leftist Indian leader, who ran unsuccessfully once before in an attempt to join some seven leftists chosen at the ballot box in recent years across Latin America. Morales had frequently criticized Mesa's free-market policies as not benefiting impoverished Indians. Among others steps, he demands nationalization of the oil industry to bring more social benefits to the poor and a constitutional assembly to address demands for more power for Indians. Critics have expressed concern that his reforms might only isolate Bolivia and cause more harm than good in a country where 64 percent of the 8.5 million population live below the poverty line. Rodriguez was expected to open negotiations with political parties on whether the vice president and other officials would also be replaced. In La Paz, Bolivia's biggest city with 1 million inhabitants, protesters who had demanded early elections danced in the streets, apparently appeased. 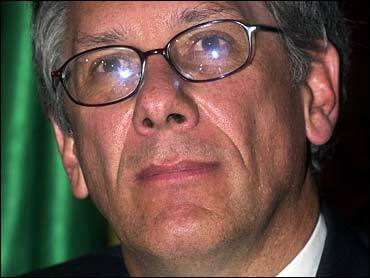 And Mesa, whose term was to have ended in August 2007, left the Government Palace wishing his successor luck. "This decision will work to bring about the pacification of the country," Mesa said. "I wish my successor the greatest success. Now may the country return to normalcy." Rodriguez said he would seek to convene a constitutional assembly to discuss providing poor and indigenous groups more say in national politics, examine demands to nationalize Bolivia's oil industry and study regional aspirations for greater autonomy. Mesa's 19-month-old U.S.-backed government crumbled in the face of a protest movement that reverberated from the high mountain plains of La Paz to the tropical lowlands of South America. Activists seized several oil field installations, crippling the national economy, while La Paz ran short on gasoline and food as the city was strangled by road blockades and daily marches. Rodriguez' appointment came after lawmakers citing security concerns moved their meeting from convulsed La Paz to Sucre, 450 miles to the southeast. After clashes in Sucre, Congress rapidly accepted Mesa's resignation Thursday night. Then both the Senate leader Hormando Vaca Diez and House leader Mario Cossio rejected the job, automatically giving it to the chief justice, who had been third in line for the presidency. Demonstrators had rejected Vaca Diez and Cossio for the job, saying they came from discredited traditional parties that Morales called the "mafia of the oligarchy." Had either accepted the position, he would have been allowed by law to serve out Mesa's term. Rodriguez, however, is required to call early elections in which Morales is likely to be a leading candidate. Rodriguez, who studied public administration at Harvard in the United States, is a respected justice who plans to return to the judiciary after his term. The month-long unrest registered its first death Thursday when a 52-year-old miner reportedly was killed in a clash at a police checkpoint near Sucre. Protests subsequently erupted in Sucre with hundreds of miners and other demonstrators clashing with riot police before Congress ultimately convened. Earlier Thursday, the head of the armed forces, Naval Adm. Luis Aranda Granados, warned both sides to avoid violence and find a peaceful solution, saying the military was prepared to safeguard democracy. "As long as there is no break in the constitutional and democratic system, we will continue to safeguard this entire process," he said.